to your various ferrous products handling operations. 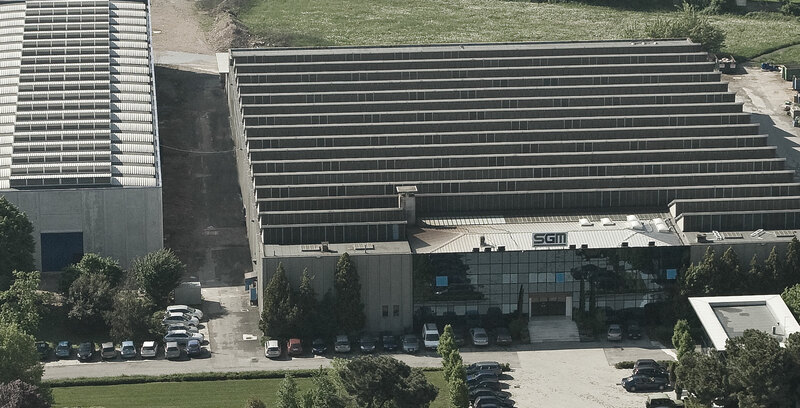 SGM Magnetics started in 1954 in Manerbio (Brescia), north of Italy, a region rich and famous for its competitive steel mills and metals industry. Our name and logo reflect our first two historical core businesses which have been lifting magnets to the steel industry and magnetic separation to the metal recycling industry. Through the years, SGM has developed a position of pioneer and leader on industrial lifting magnets and has extended its magnetic separation expertise to other in-house separation technologies that are inductive based sensor separators, X-ray separators, color sorters, gravimetric separation and processes. 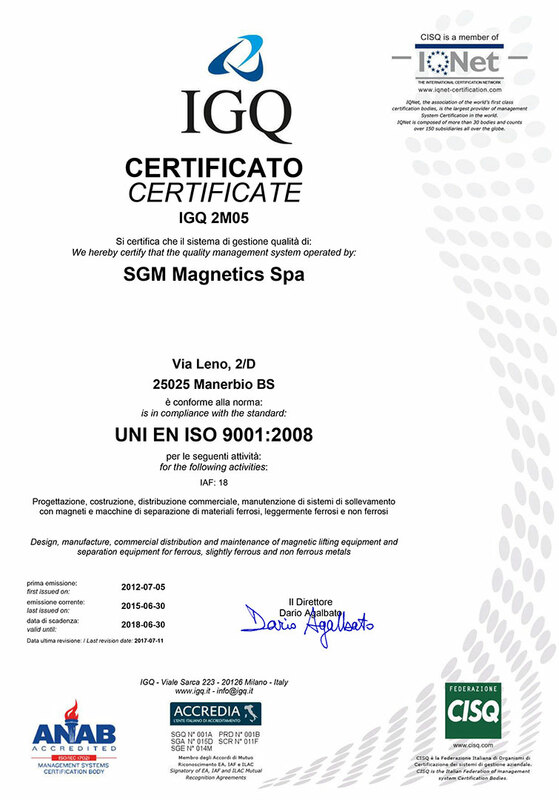 The SGM business model is based on providing technological expertise and to being close to its customers through a network of SGM Magnetics corporations located in Italy, Germany, UK, USA, China and India as well as a few long standing agents with extensive experience in the SGM products and technologies. 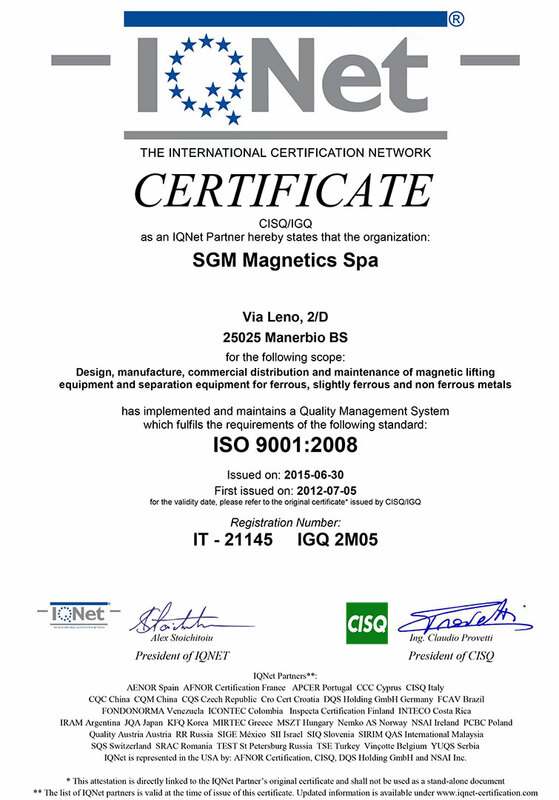 SGM disposes of three SGM demo/test centers which are located in Italy, USA and China. Years of prestigious and consolidated references all over the world have made of SGM a world leader in both lifting magnets and separation technologies. 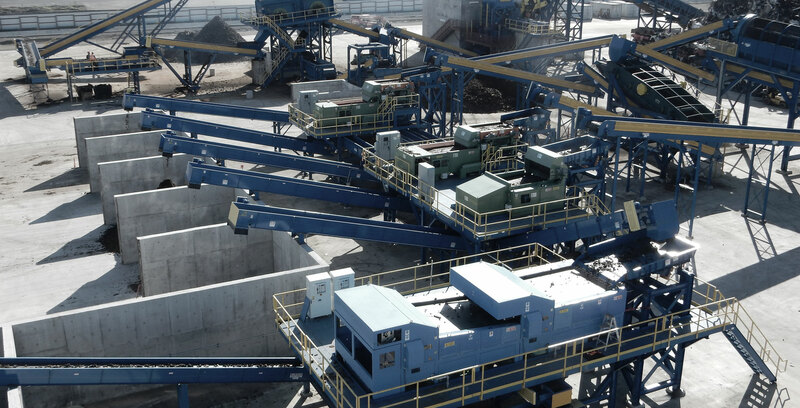 SGM starts off with standard circular electromagnets for lifting scrap and plates followed by new magnetic lifting solutions as more sophisticated mill applications were developed (slabs, billets, coils, multi-plates, rails, bundles of construction bars, structural, pipes ,...). Introduction of the Electro-Permanent Lifting Magnets quickly gained the confidence and interest of their users for the greater safety they offer. 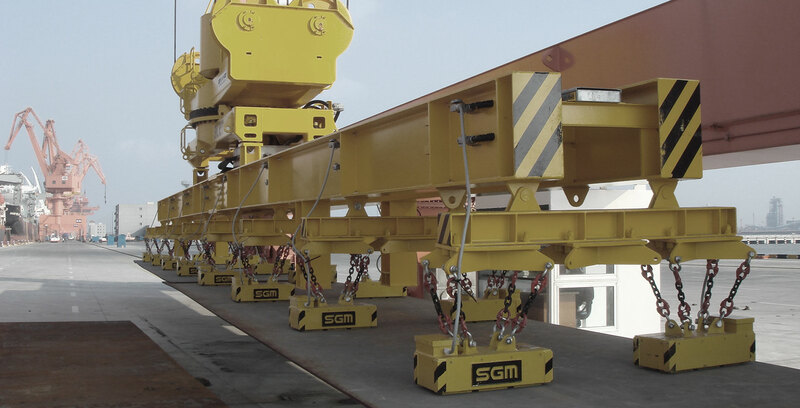 In order to meet new safety, performance and weight requirements of the oil industry for pipe lifting applications on offshore drilling platforms, SGM introduced a new generation of Rare Earth Electro-Permanent Lifting Magnets. This new technology was quickly transferred to various lifting magnet steel industry applications. Introduction of the first proprietary SGM Flux Measuring Device(FMD), which is a major innovation of safety measurement technology for determining the lifting force of magnets. Introduction of the octagonal SGM Mega Scrap Lifting Magnet featuring a proprietary double magnetic circuit allowing for handling more ferrous scrap and in a more compact way than the traditional two large round magnet solution. These scrap magnets rapidly become the reference solution for the quick and gentle loading/unloading operations of railcars and are also specifically suited for belt loading with Consteel technology. Introduction of the proprietary VHG Magnetic Circuit consisting of the use of both rare earth magnets (Neodymium ) and ferrite magnets thus combining the deep but not that strong attraction force of the Ferrite permanent magnets with the very strong but shallower attraction force of the rare earth magnets. Introduction of the proprietary SGM Dynamic Ferrous Separators (DSRP) representing a technological evolution to the traditional magnetic pulleys resulting in the possible segregation of sellable ferrous nuggets from magnetic trash. Introduction of the SGM Induction Sensor Based sorter (EMS) for stainless steel and copper wires present in shredder residue. Introduction of the proprietary SGM Polishing Drum Magnets (PDM) for separating the electrical rotors (so-called “meat ball”) from a ferrous scrap stream hence reducing the copper content in ferrous scrap. Introduction of the proprietary SGM Lifting Magnets for eye horizontal steel coils (CDMD). The CDMD measures the possible flexing and dynamic stress of those coils when handled and allows for innovative and greater safety in their handling with lifting magnets. Opening of a second SGM subsidiary on the west coast of the USA, Los Angeles. Introduction of the proprietary SGM lifting magnets with no side magnetic dispersion. These lifting magnets are especially suited for steel service centers where magnets can enter racks of steel bundles with no disturbing side attraction with steel columns or other bundles/packs next to the one being handled. Opening of SGM India disposing of a mechanical shop for both production and repair. Introduction of the proprietary SGM Eddy Current Separator TVIS spinning at 6.000 rpm provided with a titanium protection sleeve to contain the centrifuge forces of the permanent magnet blocks. Still today SGM is not only the pioneer of the high frequency ECS but, most probably, the quantity of high Frequency ECS (from 3.000 up to 6.000 rpm) supplied by SGM represents a multiple of the ones supplied by all the other brands put together. Introduction of the proprietary SGM Scrap Cleaning Line for Heavy Melt Scrap. The solution is designed to drastically reduce the about 5% non-ferrous trash present in the HMS for optimization of efficiency of the electric arc furnace. Introduction of the proprietary SGM MIMS (Medium Intensity Magnet Separator) for the iron ore mining industry. The proprietary magnetic circuit of the SGM MIMS constitutes a true technological breakthrough to the state of the art of magnetic separators for iron ore.
Introduction of the SGM X-Ray dual energy sorter (XRS) for processing metals, heavy plastics and minerals. Introduction of the SGM proprietary Smart Ballistic Separator (SBS) for processing Incinerated Municipal Waste (IBA). The separator allows the processing of wet IBA and the concentration of the solid pieces including the metals in a fraction larger than 2 mm and dryer than the infeed IBA. The SGM SBS represents a performing evolution of the state of the art for ballistic separators. Introduction of the SGM proprietary Convection Electro Lifting Magnet (CELM) for hot materials. The design of the CELM drastically extends their possible duty cycles (and life time) on hot steel loads like slabs and billets. The SGM CELM constitutes revolutionary technological breakthrough innovation related to electro lifting magnets. Introduction of the SGM proprietary Convection Electro Permanent Lifting Magnet (EPCLM) for hot materials. The design of the EPCLM drastically extends their possible duty cycles (and life time) on hot steel loads like slabs and billets. Introduction of the SGM Eddy Current Separator (BVIS) designed to perform a progressive separation of the heavier finest metals. Introduction of the SGM Dry Media Plant for shredder residue zorba as an alternative to the more capital and labor intensive wet media plants for the separation of light metals (Aluminum and Magnesium) from heavier metals (copper, brass, zinc, led,...). Introduction of the SGM High Power Air Gravity Separation Table (PDS). Introduction of the SGM latest generation of X-ray separator (XRS) for the process of shredder residue fluff to reduce the chlorine and bromine content to less than 1% in over 70% of the fluff residue. Opening of the SGM agency with Machinery Specialist Pte for the Australian, New Zeeland and New Guinea markets. Introduction of the SGM “No Blade (no granulator)” proprietary process for chopping insulated copper wires (ICW) recovered by sensor based separators from shredder residue. 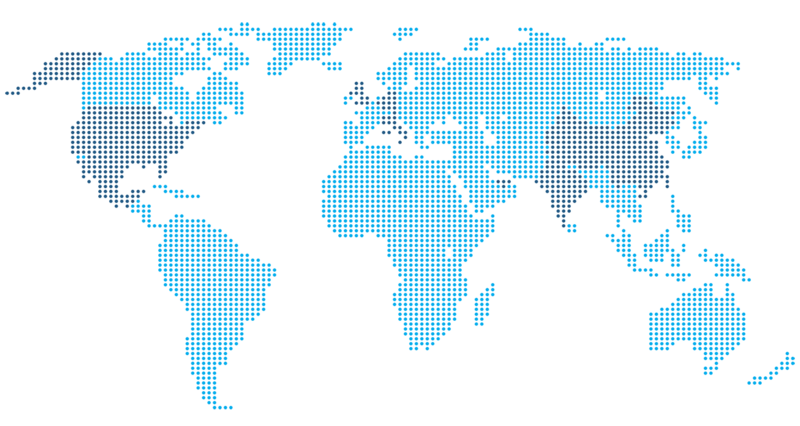 We have several offices and distributors all over the world. Please refer to the sales office nearest to your location or contact directly our headquarters offices in Italy.